Sergei Bobrovsky had 32 saves, and the Columbus Blue Jackets scored two power play goals to get past the Chicago Blackhawks, 3-2. Columbus, with six days off, and an 0-2 start, were ready and waiting for the Hawks as they attempted a combined 50 shots while blocking 20. The Blackhawks penalty kill was dismal again as the the Jackets went 2 for 2 with the man advantage. Zach Werenski started the scoring with a PP goal half way through the first period. Once again, Corey Crawford was completely screened with no chance to make the save. 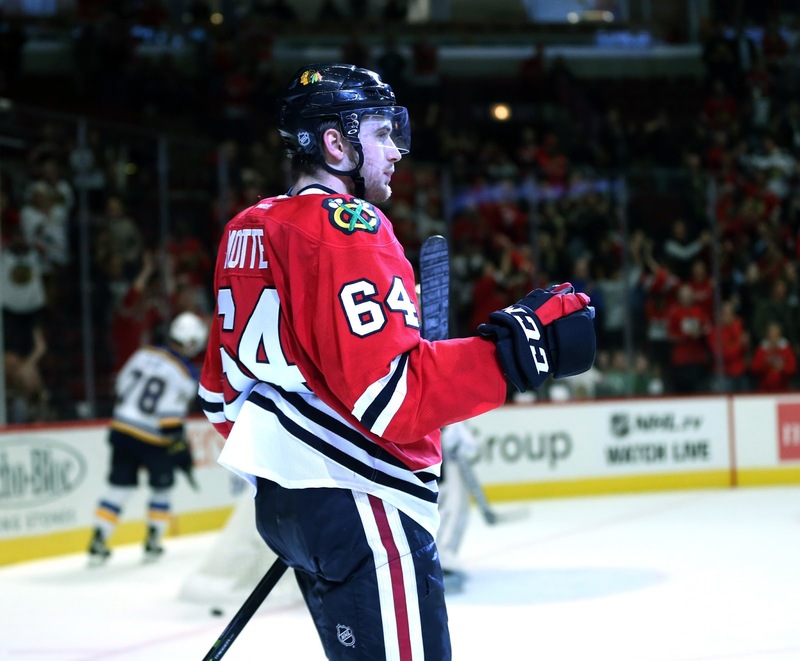 In the second, Tyler Motte would score his first career NHL goal after picking up a Jonathan Toews rebound and tying the game at 1. 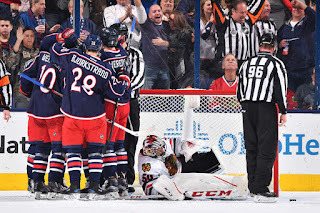 That lasted just over two minutes until Nick Foligno tallied another PP goal after Crawford made the initial stop, he had no help to clear the puck as the rebound was put behind him. Niklas Hjalmarsson when asked about the PK: "We have to hit the reset button & just bear down & find a way to get it done because it’s losing us games right now." William Karlsson extended the lead to 3-1, before Richard Panik, scored his 5th goal of the year on a fortunate bounce to bring the Hawks to within 1. Bobrovsky then stood on his head as the Hawks made a late push to try and tie the score late in the 3rd. With a late power play, the Hawks pulled Crawford for the extra attacker. 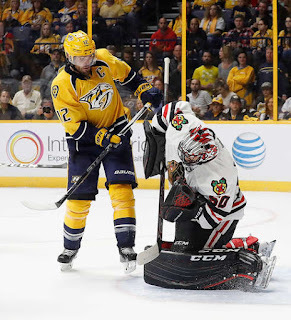 Toews couldn't corral a bouncing puck with an open net, Brent Seabrook grazed the goal post in the waning moments as time ran out for the Hawks. Notable Mentions: The Blackhawks PK for the year, is now 42.1% (8 kills on 19 time short-handed). By far, the worst in the NHL. Trevor Van Riemsdyk left the game early with an upper body injury. When Coach Joel Quenneville was asked about his status, "He'll be out for a bit". Patrick Kane had an incredible 28:48 of ice time in the loss. The Hawks had 17 missed shots during the game. You can't score if you can't get the shots on not. 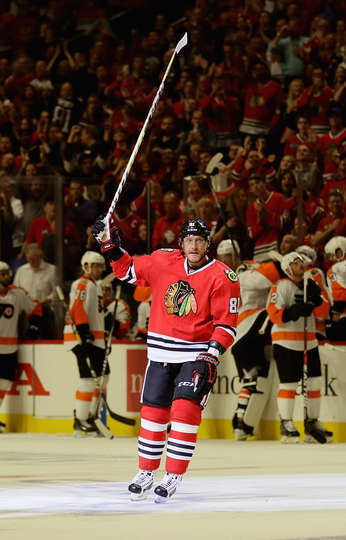 Marian Hossa joined an elite club tonight as he scored his 500th career goal. 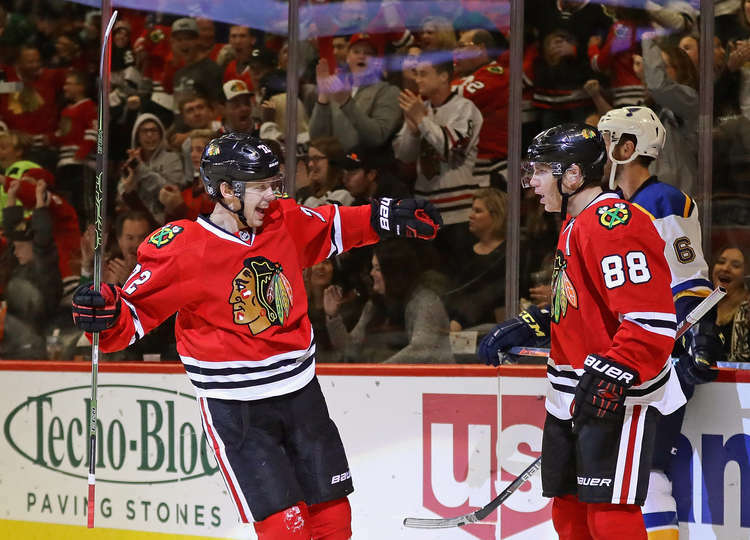 Artem Anisimov and Patrick Kane tallied four points each, as the Chicago Blackhawks won a wild game against the Philadelphia Flyers, 7-4. 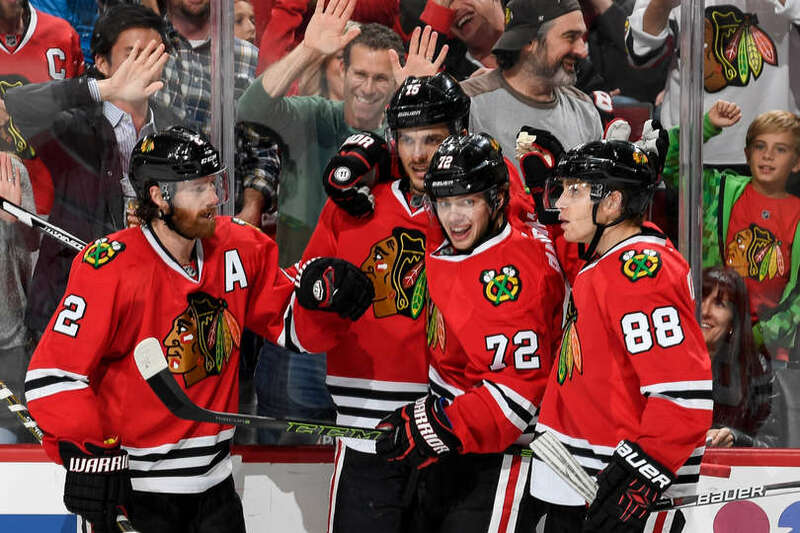 The Blackhawks jumped to an early lead, just :56 into the game, as Kane scored his 1st of the year as he grabbed a loose puck and performed a wraparound to give the Hawks a 1-0 lead. Dennis Rasmussen grabbed a puck after a a blowout by Flyers defenseman, Ivan Provorov, and went forehand, backhand, 5-hole, to make it 2-0. Artemi Panarin added his 1st of the year on a one-timer from a shot/pass from Brent Seabrook on the power play, to give the Hawks a 3-0 lead after the first period. In the second, Hossa did what he always does. Powers himself to the net, and flipped a backhand shot past Flyers goalie, Michal Neuvirth, for a 4-0 lead on his 500th career goal. There was a stop in play as the crowd erupted to salute the DemiGod of the NHL. A class move by the Flyers club was recognized as they all sat on their bench to give Hossa his moment. After that point, the Flyers came back with a furious comeback as they erased the 4 goal lead to tie the game. Right before the end of the 2nd period, after a Kane penalty, the Blackhawks penalty kill let them down again as the Flyers made it 4-1. The Flyers carried that momentum into the 3rd as they scored 3 more goals (one more given up on the penalty kill) within the first 4 minutes to silence the United Center crowd. Fortunately, the Blackhawks found their stride at the 10:24 mark of the 3rd as Anisimov scored the first of his two goals on the night to allow the Hawks to regain the lead. 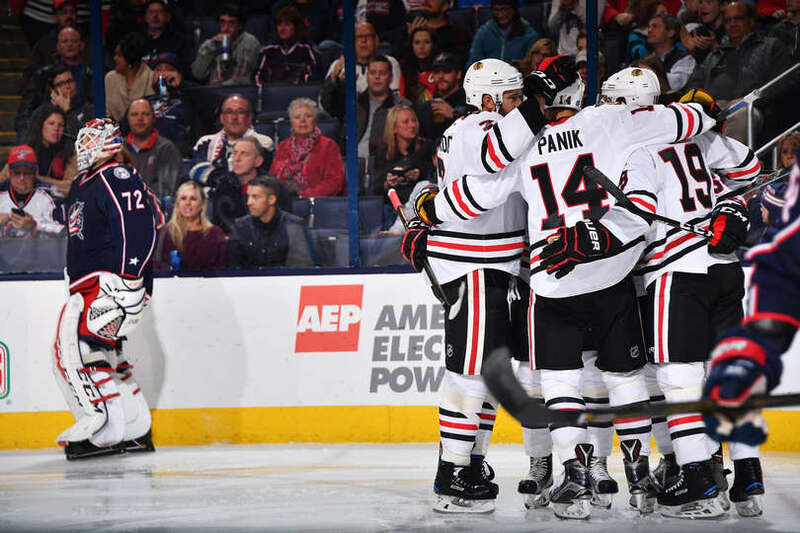 Just over 5 minutes later, Panarin struck again on a one-timer, set up by...who else...Kane, to extend the lead to 6-4. Anisimov would add an empty net goal to seal the victory. Notable Mentions: Marian Hossa became the 44th player in NHL history to record 500 goals before leaving the game with a lower body injury. 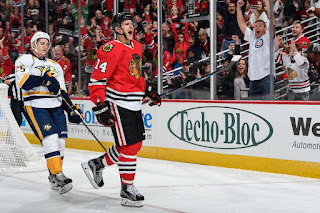 Seabrook, who had three assists tonight, now has 5 points in 4 games so far this year. He's definitely earned the "A" he was awarded with at the beginning of the year. 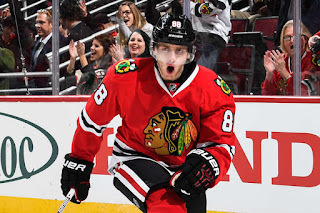 Kane tied Kenny Wharram for 9th place on the Blackhawks All-Time Goals Scoring List. The Hawks penalty kill is a dismal 43.75% efficiency, (7 kills on 16 chances), worst in the NHL. The Chicago Blackhawks and the Nashville Predators played the second half of a home and home series at the United Center tonight. 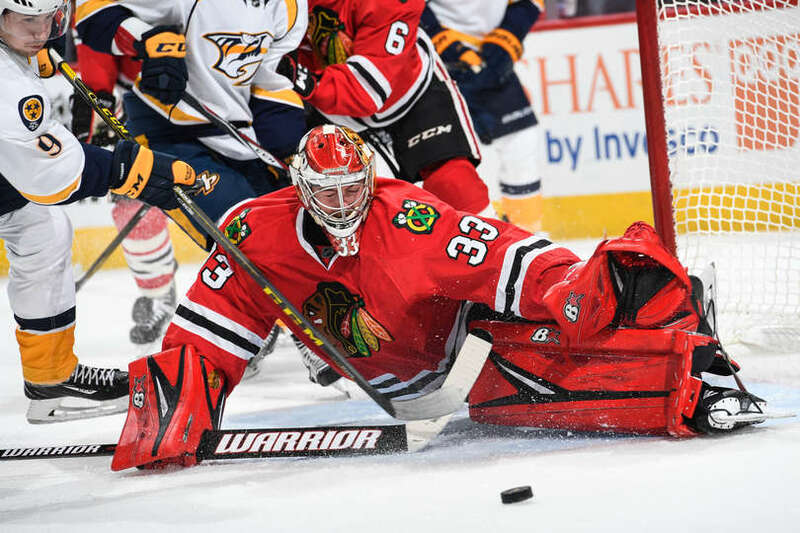 Scott Darling got his first start of the season stopping 33 shots, and Richard Panik recorded his first career hat trick as the Blackhawks held off the Preds, 5-3 for their first win of the season. It didn't come easy as Darling was tested early and often, but he came up with save after huge save. The Blackhawks went to the penalty box only twice tonight, although they gave up one power play goal. Nick Schmaltz started the scoring with his first career goal, 6:36 into the first period. Brent Seabrook followed, as did Panik's first goal of the night, as the Hawks built up a 3-0 lead, half way through the first period. Then, Nashville decided to make things interesting, by scoring the next two goals, both within 2 minutes of the end of the first and second periods. 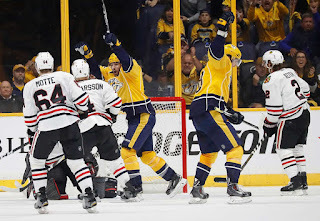 The third period started tense, but Panik put fans at ease as he took a Marian Hossa centering pass in front of the net and deposited it past Predators' goalie, Marek Mazanec, to provide a little breathing room, and a 4-2 lead, at the 4:56 mark of the third. That lasted 5 minutes until Viktor Arvidsson received a 160 foot pass from Mattias Ekholm and got around Brian Campbell and got one past Darling to bring them to within 4-3. 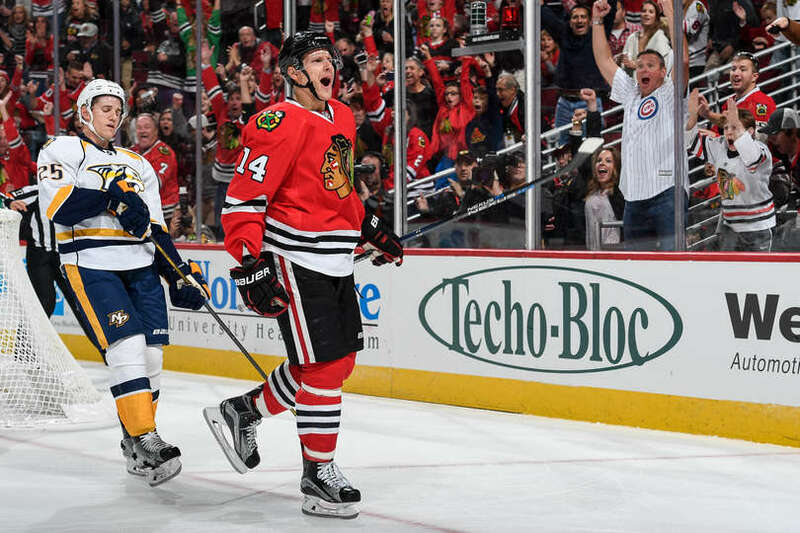 Panik would complete his natural hat trick after receiving a nice pass from Patrick Kane to complete the scoring with less than two minutes remaining in regulation. Notable Mentions: Tyler Motte had another productive game picking up his 2nd point in 3 games. He drew a penalty on P.K. Subban, after poke-checking a puck from him. 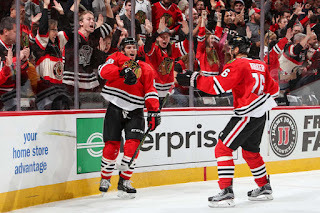 Brent Seabrook had a complete game, compiling 2 points (1G 1A), 5 hits, and 3 blocked shots over 23:15 TOI. Marian Hossa still reminds on 499 career goals. The Chicago Blackhawks went on the road for the first time this year as they started a home and home series in Smashville against the Nashville Predators. For the second straight game, the Blackhawks penalty kill was dismal and cost the Hawks the game as they fell 3-2. Three power play goals were scored by the Preds. All of which, Corey Crawford never saw. That turned out to be the difference in the game. Ryan Johansen had 3 assists, while Mike Fisher and Roman Josi, both had a goal and an assist for Nashville. P.K. 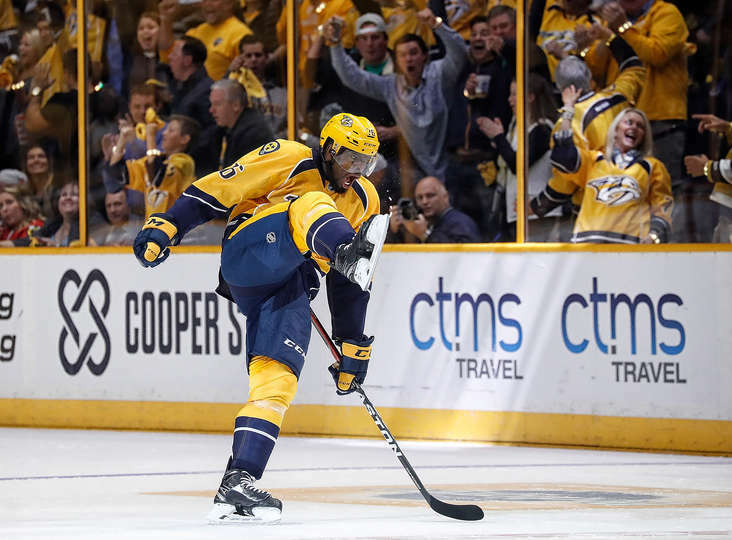 Subban started his career in the puke yellow sweater with a bang as he scored on his first shot as a Pred. He also was a presence that could only resemble David Backes. He hounded both, Jonathan Toews and Patrick Kane all night. Marcus Kruger got the Hawks in front, just 2:39 into the game to give the Hawks an early lead. Subban then tallied for the first of the three PPGs for Nashville. Niklas Hjalmarsson, in his first game back from suspension, gave the Hawks a 2-1 lead before the Preds converted on their 2nd power play. Mid-way through the 2nd period, Fisher gave Nashville their first and only lead of the game which was all they needed. The Blackhawks will have to make some adjustments on their penalty kill, which they did not do throughout the game tonight. If they are going to let Crawford fend for himself with a man in front of the net, they are going to have to have their penalty killers out blocking shots. Ryan Hartman did so tonight, but left the game early with a lower body injury. Quenneville when asked if Hartman's injury will last weeks: "He'll be out for more than a few games." Notable mentions: The Blackhawks have given up 8 goals this year. None of them have come at even strength. Faceoffs continue to be a problem as they only won 44% of their draws on the night. They also need to take better shots. Nashville had 19 blocked shots. Duncan Keith had 6 of them blocked. he was credited with 1 shot on goal tonight. 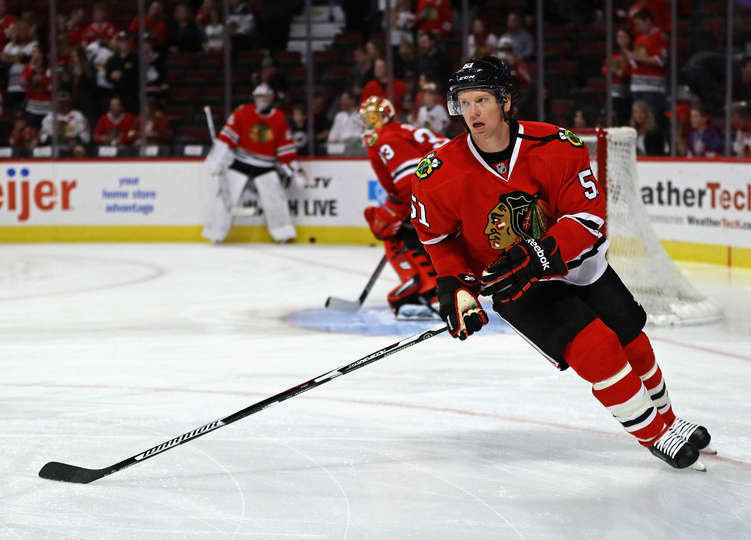 Marian Hossa was active, but is still searching for career goal #500. 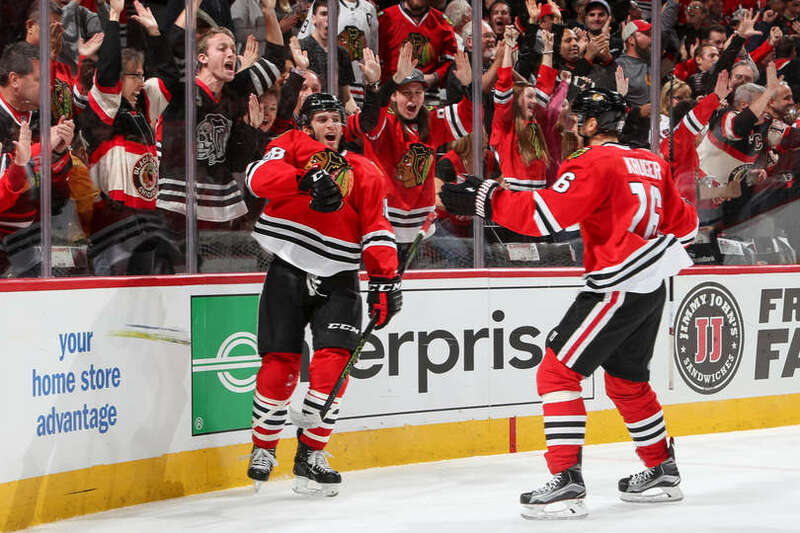 The Chicago Blackhawks started the season with a dud as they fell to the St. Louis Blues, 5-2. 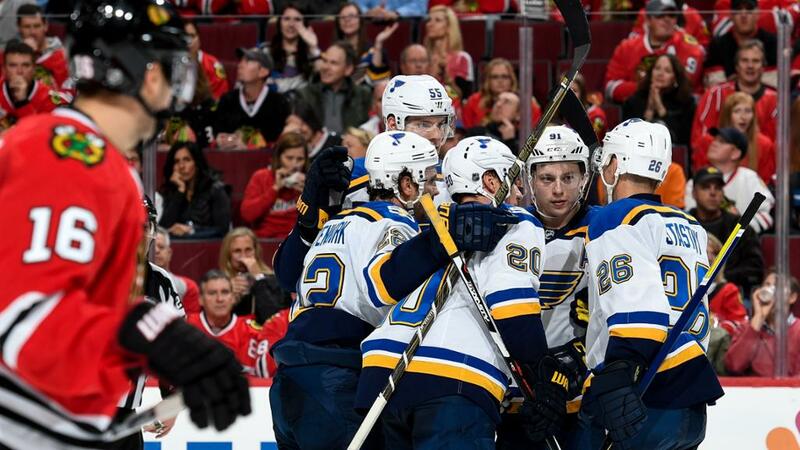 Vladimir Tarasenko tortured the Blackhawks, once again, as he had a 3 point night (2G 1A). The Blackhawks initially started the game well with leads of 1-0, and 2-1, before the Blues rallied with four unanswered goals. 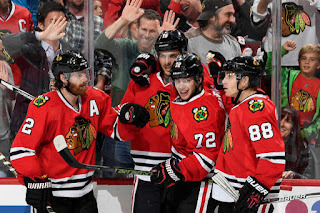 It started well as Richard Panik opened the scoring on the power play and then Ryan Hartman earned his first NHL career goal, as Tyler Motte earned his first career NHL point as he assisted on the goal. Then, penalties became an issue for the Hawks when, in the last 2:46 of the 2nd period, three penalties were called against them. This, resulted in two of the three power play goals on the night for the Blues. 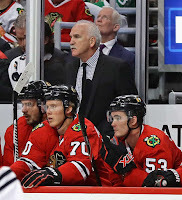 Coach Joel Quenneville said after the game, "We put ourselves in a tough spot". After that, the sail seemed to go out for the Blackhawks. They played small, being out-muscled for pucks against the boards, and it looked as if the Blues had an extra step on them for the remainder of the night. The last goal scored by St. Louis, was actually by the Blackhawks, who accidentally scored while having their net empty. Corey Crawford was busy in net, stopping 29 of 32 shots, while Jake Allen of the Blues needed to stop just 17 of 19.
Notable Mentions: The 3rd line for the Blackhawks (Motte-Kruger-Hartman) were their best line tonight. 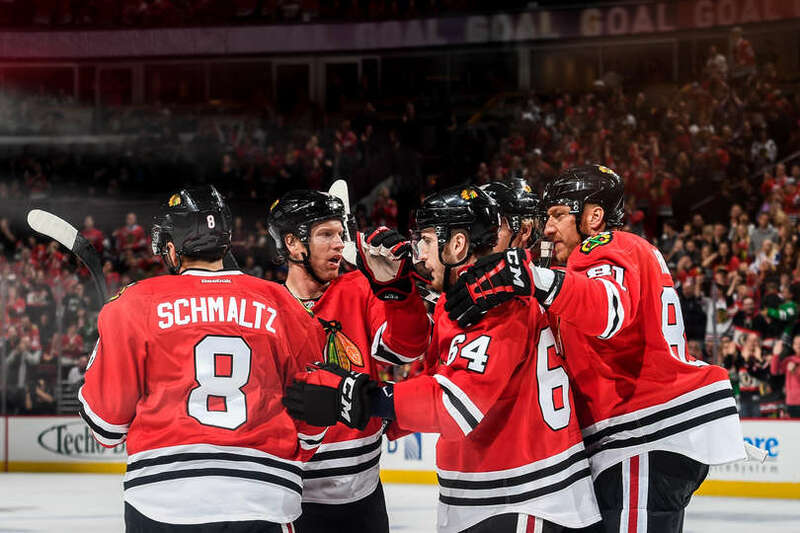 Taking away the 52% faceoff percentage by Jonathan Toews, the team won just 30% of their draws tonight. Jordin Tootoo, in his Blackhawk debut, played just 4:26. The Chicago Blackhawks completed the 2016-17 preseason tonight with a 2-1 loss to the St. Louis Blues. The games start counting now, starting Wednesday, the 12th, against St. Louis at the United Center. The top brass have some hard decisions to make with their young talent. Those that have had a notable preseason include: Tyler Motte, Alexandre Fortin, Nick Schmaltz, Ryan Hartman, and Vincent Hinostroza. With the departure of Andrew Shaw, and Teuvo Teravainen, there are two main roster spots available. Hartman was rumored, at the trade of Shaw, to be the leading candidate for replacing him. Hartman, 22, had a solid preseason, and should make the roster, although he still needs some time to grow. A pleasant surprise, Motte, 21, has been arguably the best rookie this preseason. Tallying two goals and one assist, he's shown patience with the puck, willingness to use his body in the dirty areas, and being a presence in front of the net. Motte, decided to leave Michigan early, to join the Blackhawks, and it looks to have been a wise choice. The weakness in the postseason last year was undoubtedly the defense, which was addressed in a big way during the off-season by bringing back veteran Brian Campbell, 37, for a second tour of duty. 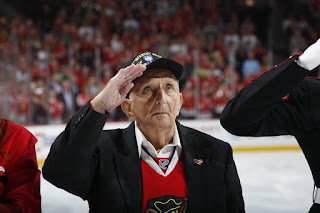 Despite his age, he gives the Blackhawks a solid #4 defenseman that can eat up minutes and provide solid play every night. He led the Florida Panthers last year in TOI (22:17) along with +/- (35). With the addition of KHL defenseman, Michal Kempney, who will make the opening night roster, the defense has become the Blackhawks' strongest part of the team. The offense, has now become their weakest spot. Five of the twelve forwards from the 2015 Stanley Cup team remain on the team. Last year, with the MVP performance of Patrick Kane, (106 pts, 46G, 60A), and the Calder performance of rookie, Artemi Panarin, (70 pts, 30G, 40A), they combined for over 32% of the total goals scored for the Blackhawks last season. Coach Joel Quenneville's task is to how to provide a balanced attack over all four lines. With an aging Marian Hossa, 37, and a young and inexperienced Richard Panik, 25, the top line, with Captain Jonathan Toews, could use some help. 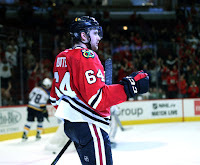 Whether Motte, or one of the other young prospects can step up to become a top 6 forward, is yet to be seen. It could take Quenneville up to a dozen games, possibly more, to juggle lines around to see what chemistry can be built between players. He may split Kane and Panarin in the beginning to find that balanced attack, but he knows he has them when it is needed most.